There is something about buttery cinnamon and sugar encased in a warm dough, slathered with cream cheese that makes you say “AHHHH”. The smell of cinnamon evokes a warm homey feeling for me –and I don’t think I am alone here. Romans used to use cinnamon in their love potions, Egyptians in their embalming rituals, and I used it in the World’s Best Cinnamon Rolls. I have made several different recipes for cinnamon rolls for the years, all were good, but when I made these I knew I found the recipe that I hope to become famous for –at least in my family. My great grandma Dorothy makes a mean cinnamon roll(I don’t have her recipe, yet), but I would totally take this recipe and do a Bobby Flay style throwdown against her. I mixed the dough and let it rise in my bread machine, before I rolled it out and filled it. These cinnamon rolls are as big as your head and incredibly delicious. I looked through the cupboard and realized I was out of vanilla extract, so I added some vanilla instant pudding and skipped the additional sugar. 1/2 c milk, room temp. 1/2 c half & half, room temp. Add the ingredients through yeast in the order listed, use 1/4 c of the butter. I used the dough cycle. Once it was done kneading and rising, roll the dough out on a floured surface into a 18x30 inch rectangle. Mix together remaining 1/4 c butter, brown sugar and cinnamon. Spread this mix over the rolled out dough. Starting at the long edge of the dough, roll up tightly, pinching to seal. Using plain dental floss, slide it under the dough log and slice your rolls every 2 inches. Line a jelly roll pan with greased parchment paper. Place rolls 2 inches apart. Cover and let rise in a warm place (the oven with the light on is perfect) until doubled in size, about 1 hour. 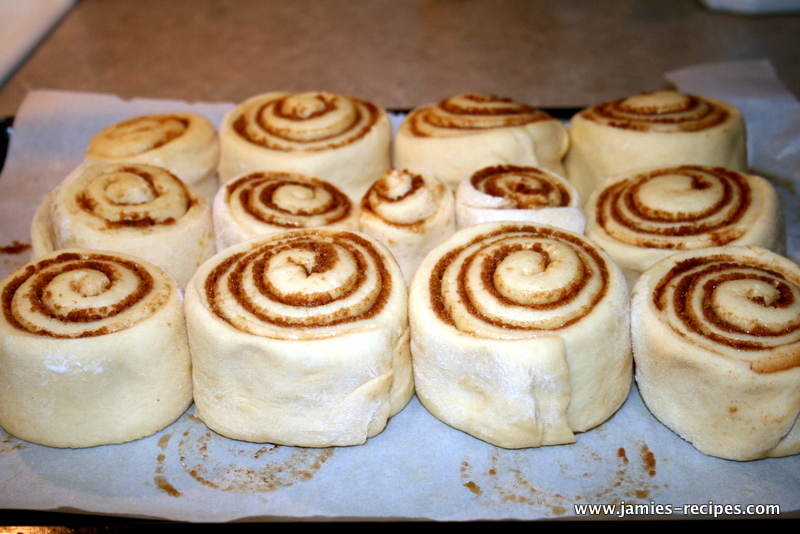 Rolls should be touching each other after rising, if not push them together so they are touching. Bake in a preheated 350 degree F oven for 20 minutes or until golden brown. Mix until smooth and well combined. 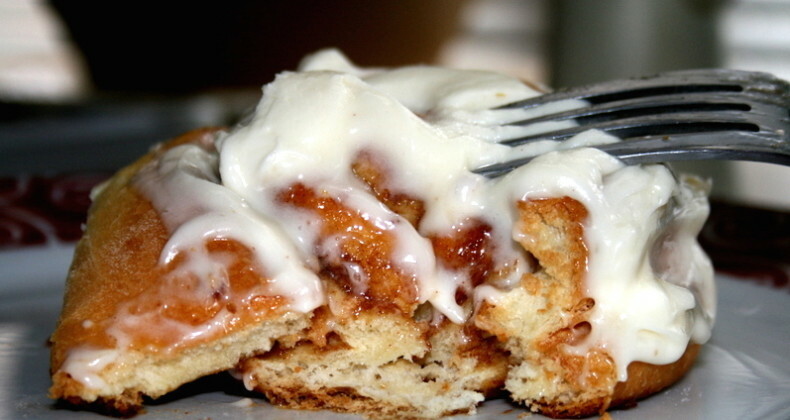 Spread on warm cinnamon rolls and enjoy immediately! ENJOY! Oh my! I gained 5 pounds just looking at that picture. You should totally do the BF Throw Down with that recipe. These look absolutely perfect!! Do you have the instructions for those without a bread machine? I’m making these for a family brunch on Saturday, but I have the same question as Memoria. How can I let the dough rise with the bread machine? Can I just set it in a bowl and wait? If so, how long should I wait for? Whats the 3rd ingredients half and half? Half & Half is a mixture of milk and cream that is sold in stores in the US.You could use full fat milk or cream to replace it.